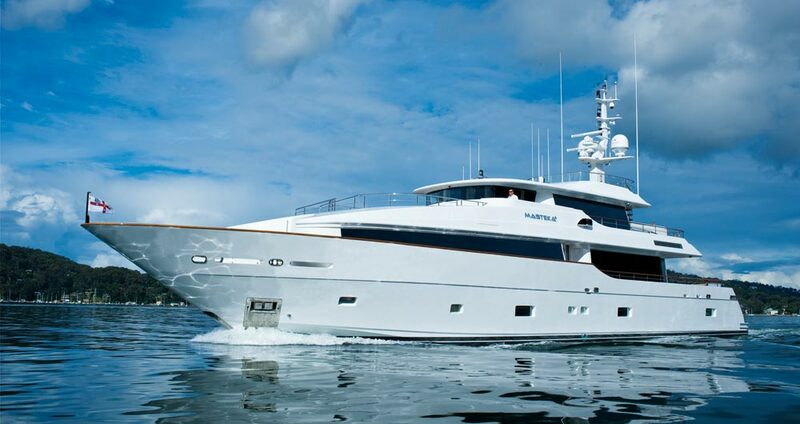 Motor yacht MASTEKA 2 is a modern, 37.1m (122’) yacht with expedition capabilities and exceptionally seaworthy. 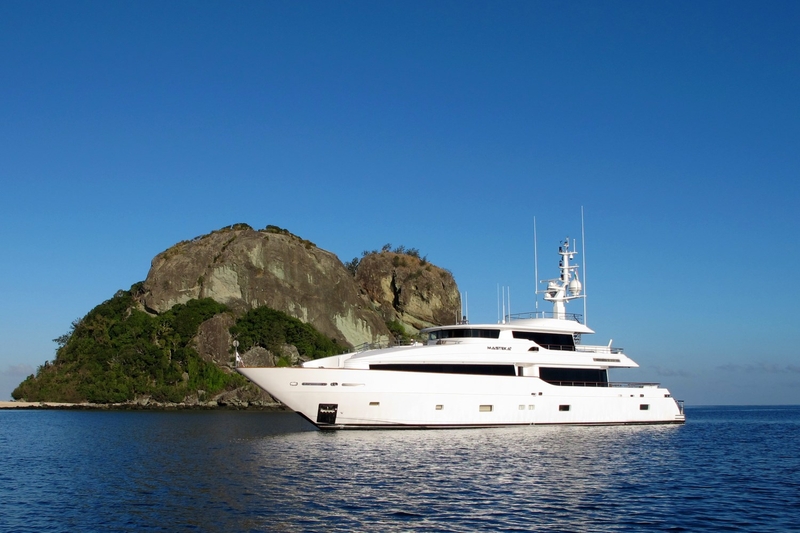 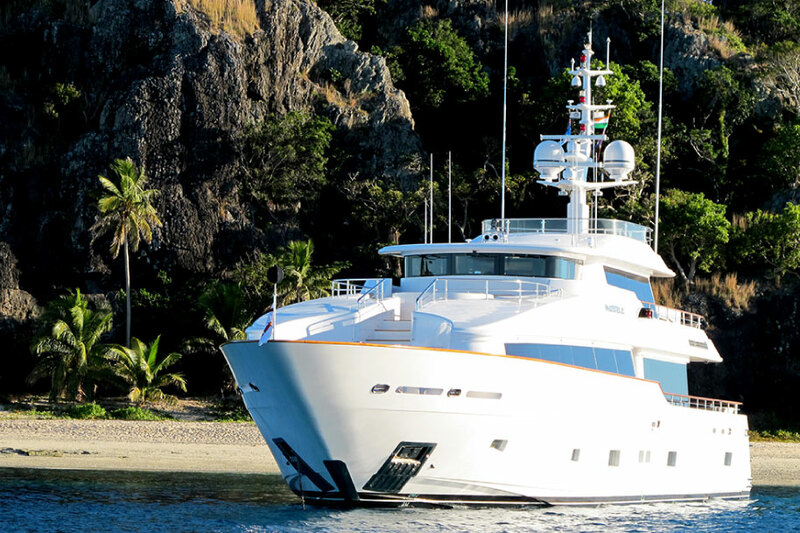 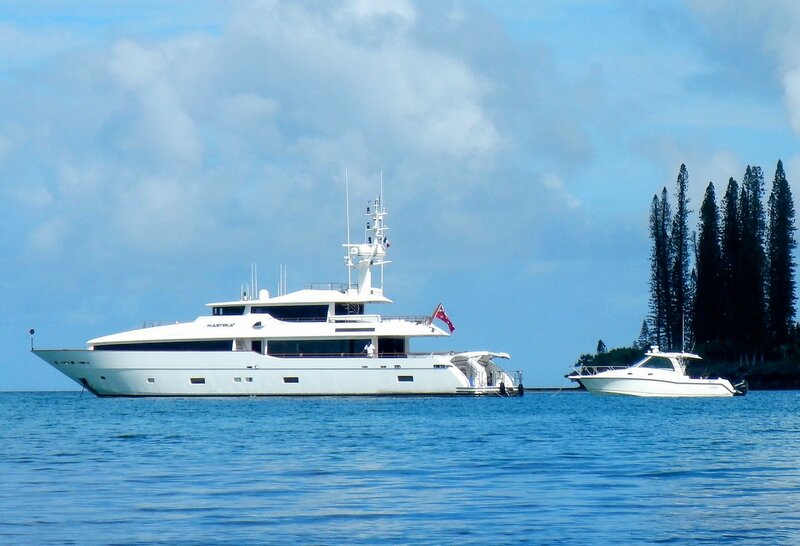 This Dubois styled yacht was built by the Taiwanese Kha Shing yard in 2009. 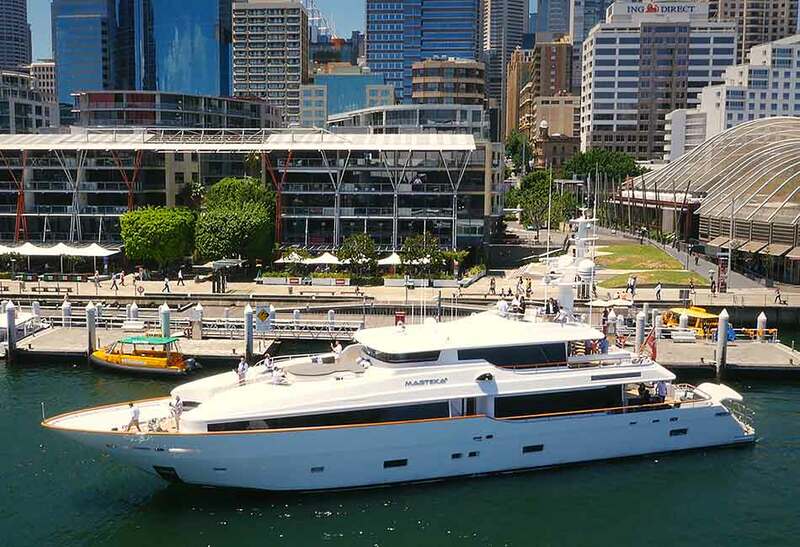 She reveiced an extensive refit in 2017. Ed Dubois penned MASTEKA 2 ‘s design, making a statement with its sharp, angular lines, while the engineers at Kha Shing addressed the considerable structural design and construction detail. 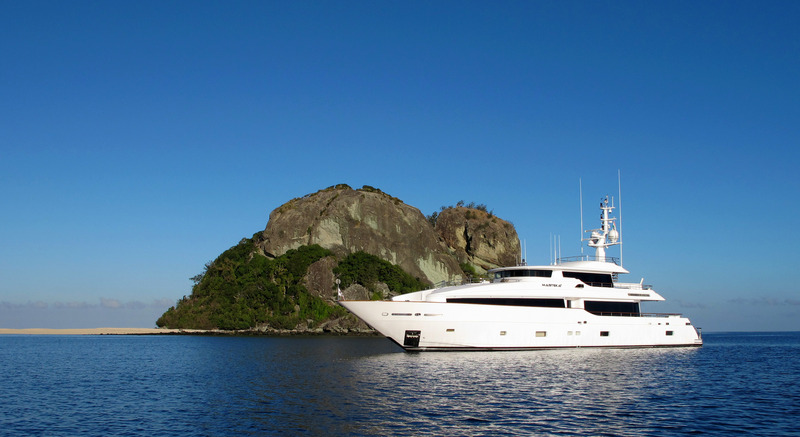 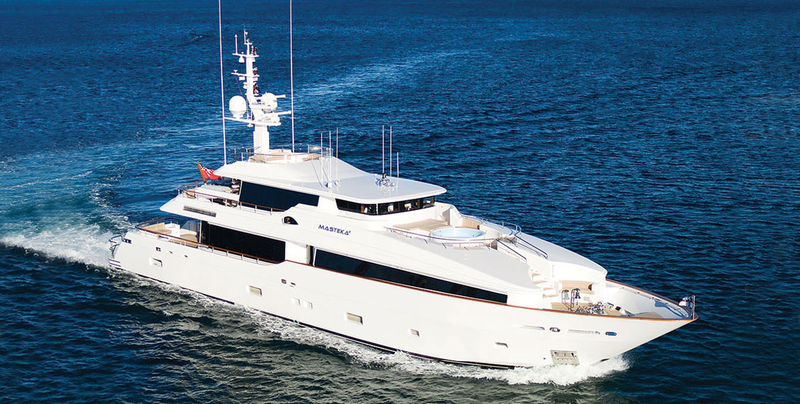 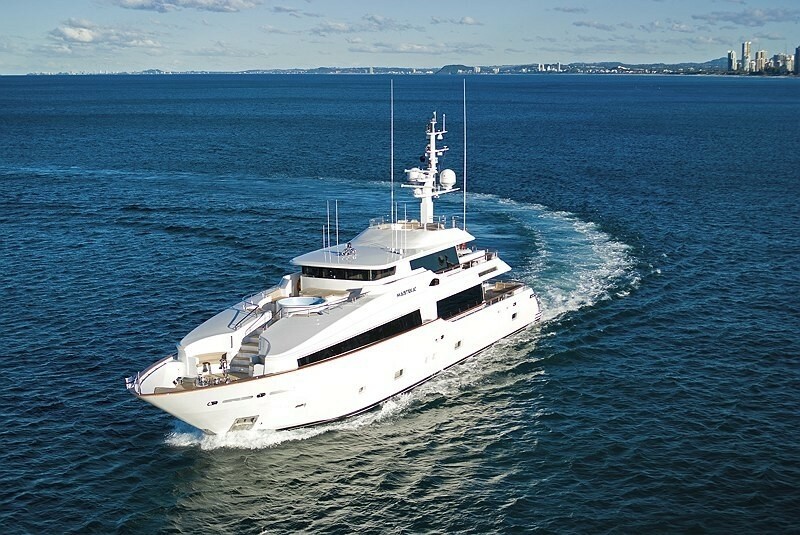 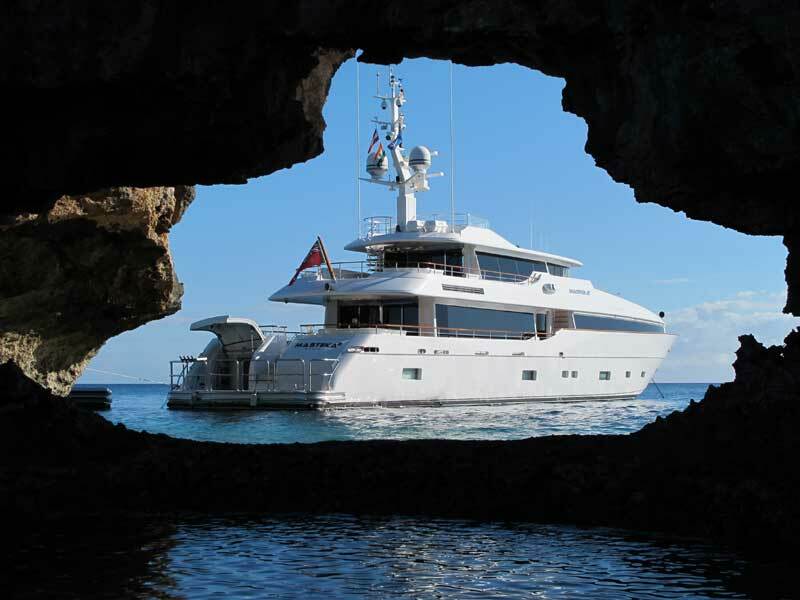 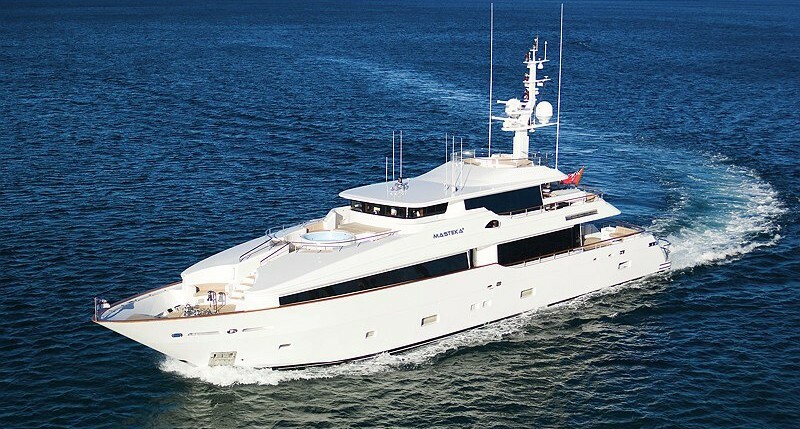 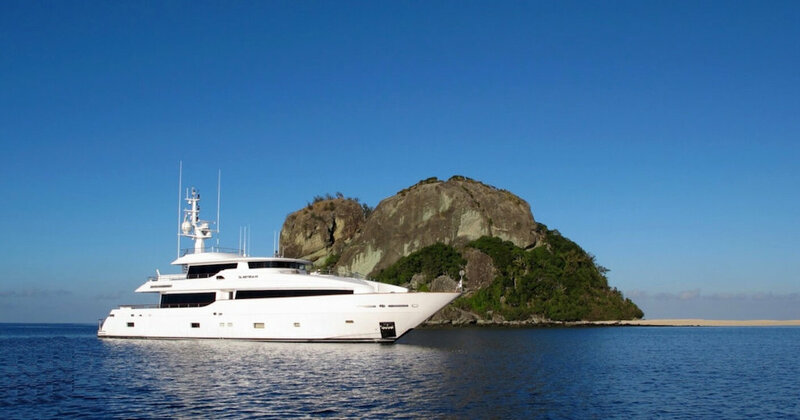 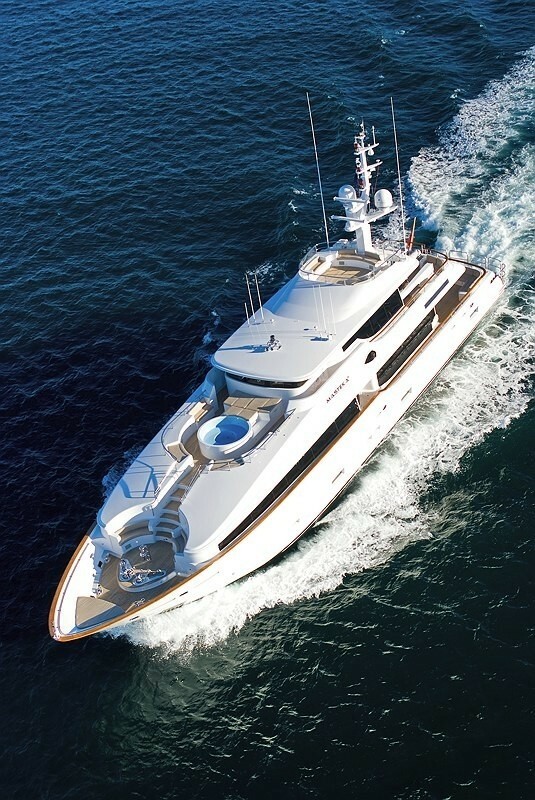 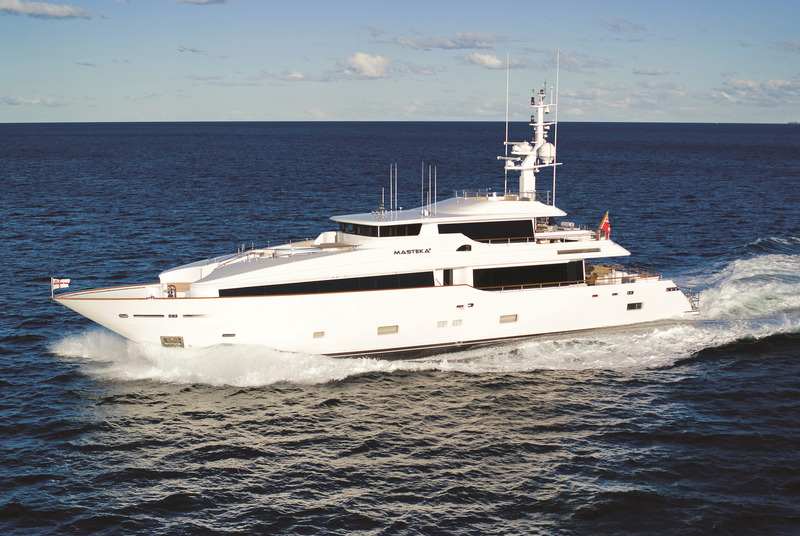 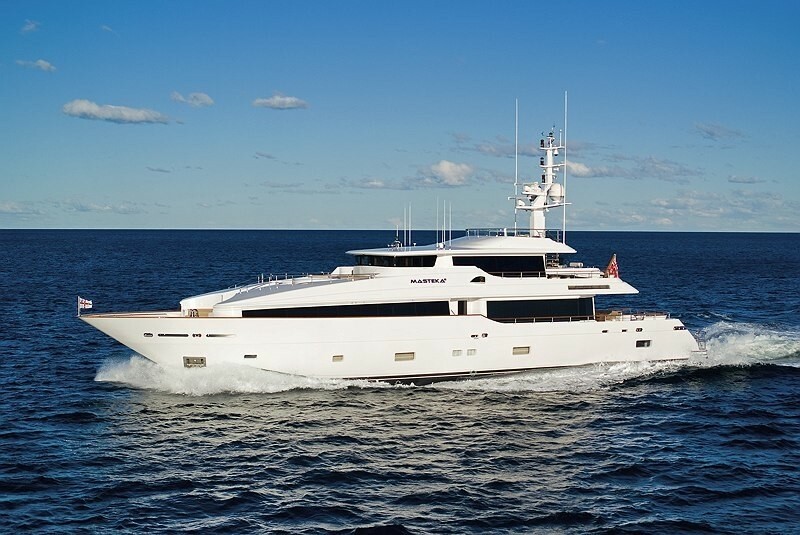 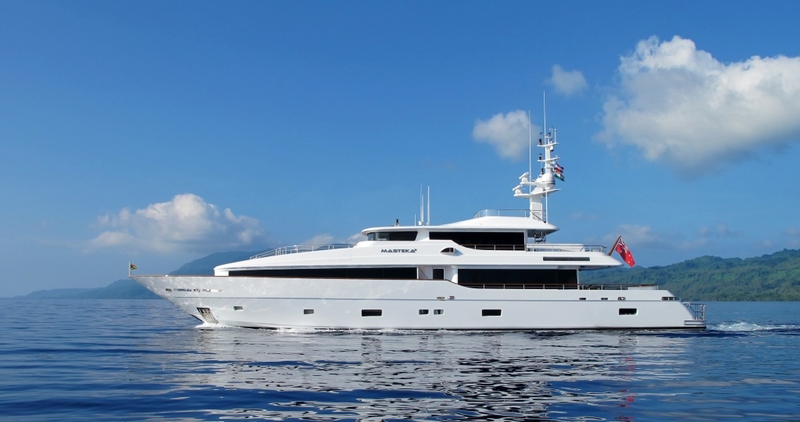 She was nominated in 2009 for the Super Yacht of the Year Award in the 30-40m category. 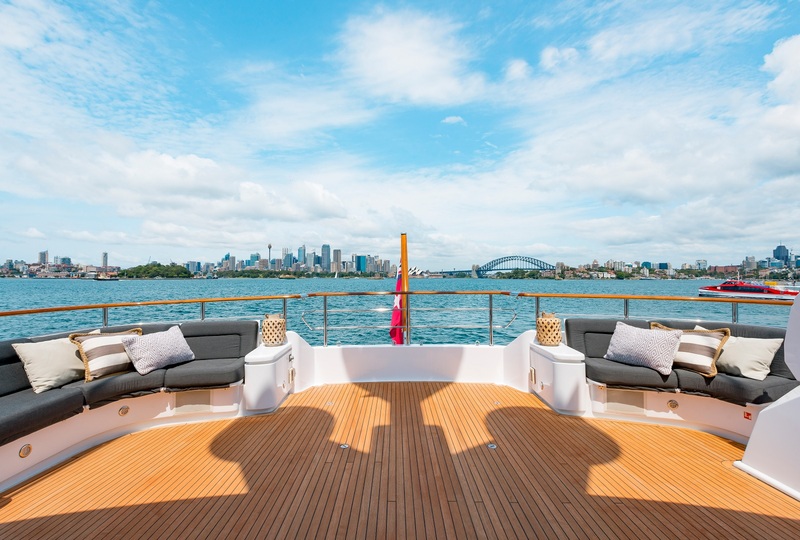 From the moment you set foot on the modern and elegant superyacht MASTEKA 2 you get a feeling of style, comfort and function. 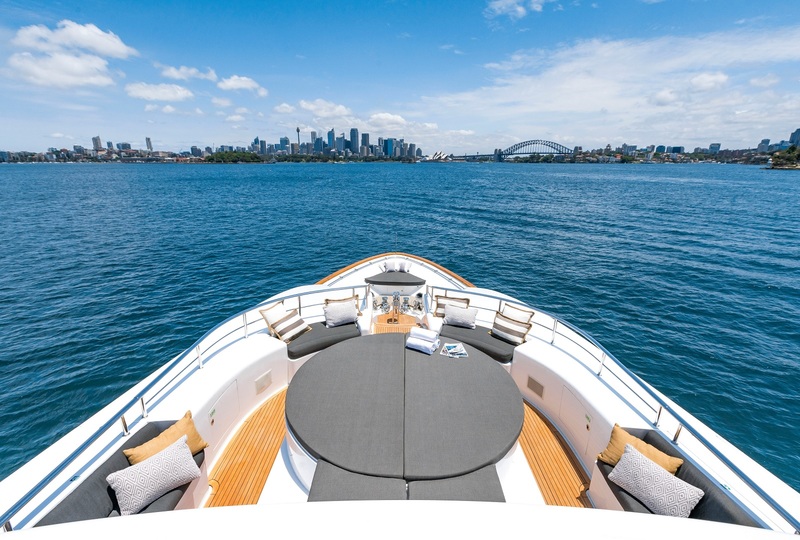 The design of all the interior spaces of this yacht is characterised by unusually large panoramic windows and ports, providing a light-filled ambience wherever you are on board. 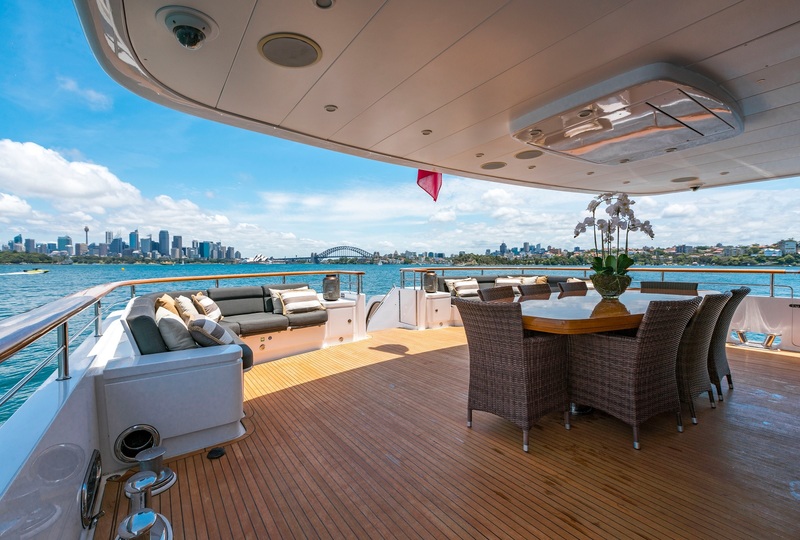 The luxurious interior design is understated in a contemporary Australian manner. 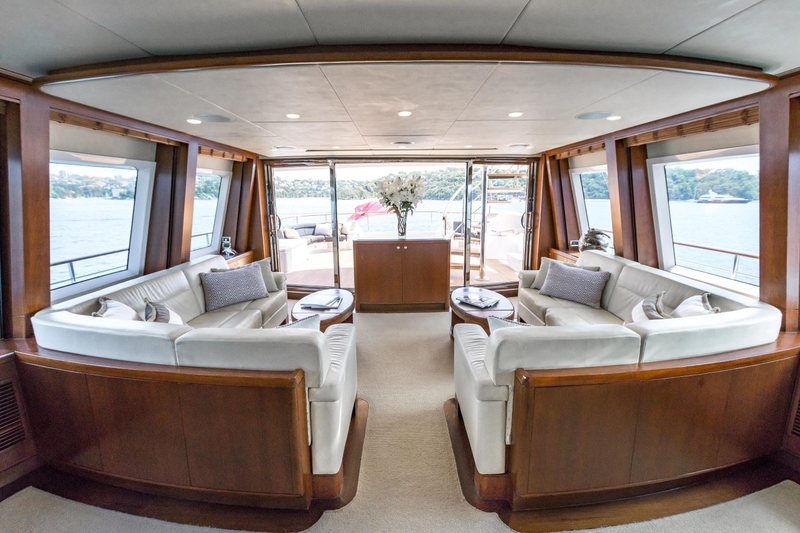 Interior finishes are of medium-dark stained cherry wood in a satin finish, accented by luxuriant cream carpeting, often with dark stained timber floor surrounds. 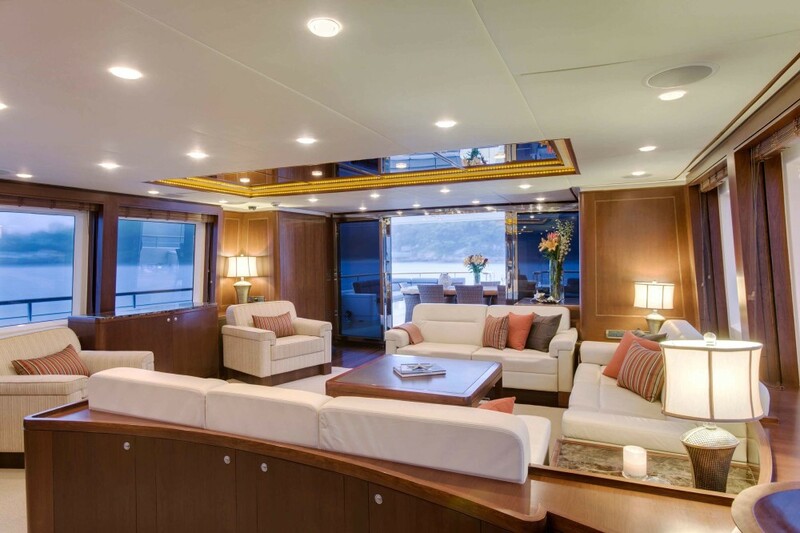 There is generous use of double-stitched leather panelling in wall and door trims to lighten the overall look and soften the appearance. 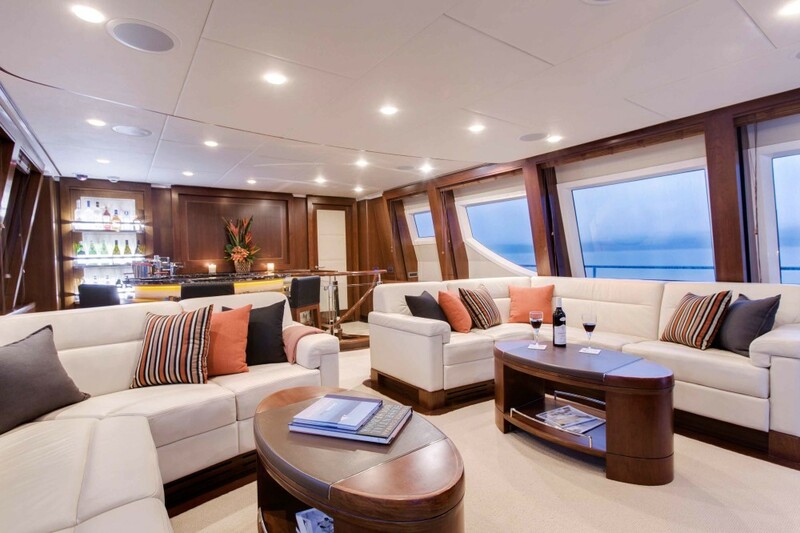 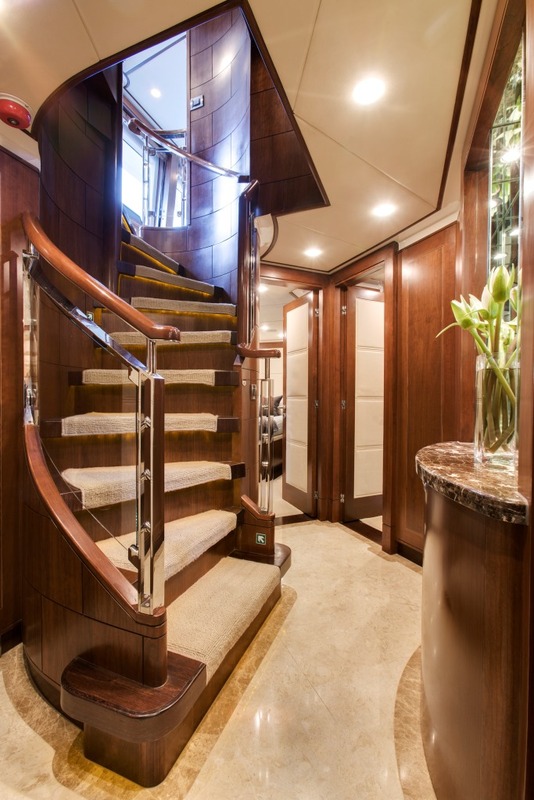 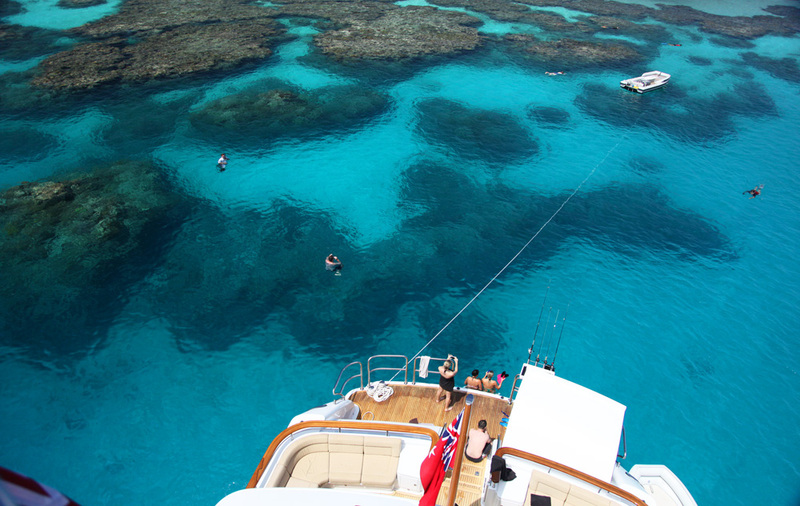 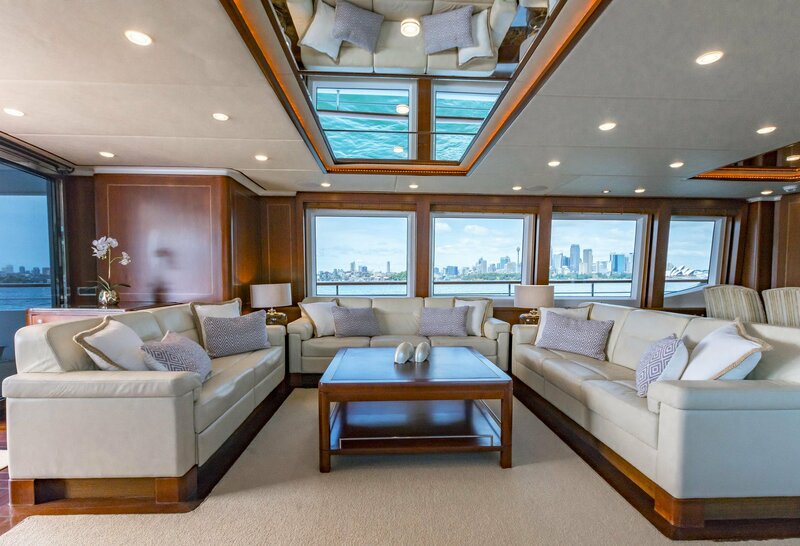 This luxury yacht boasts a full-beam comfortably furnished saloon and dining area. 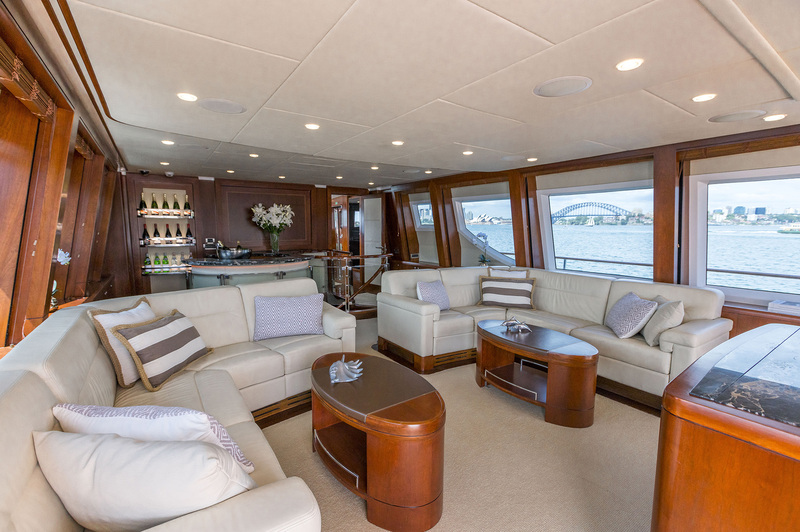 The salon features three comfortable couches, two occasional chairs and a coffee table. 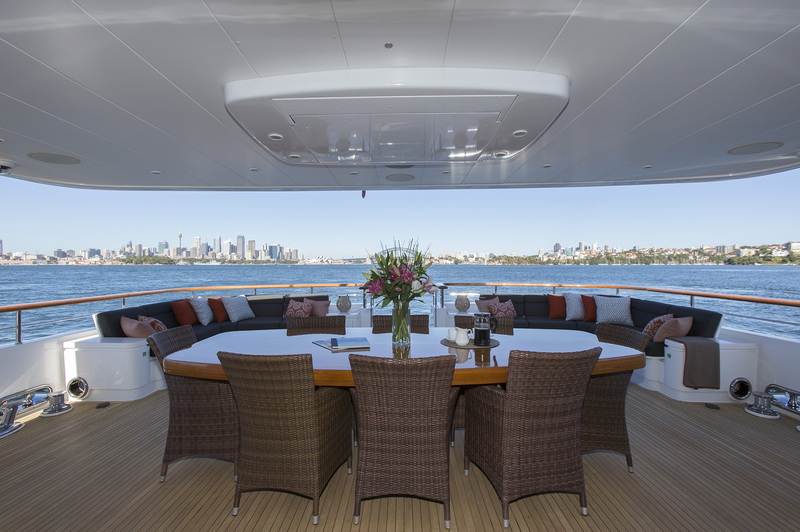 Further forward is the formal dining area with a beautifully handcrafted, polished timber table and chairs. 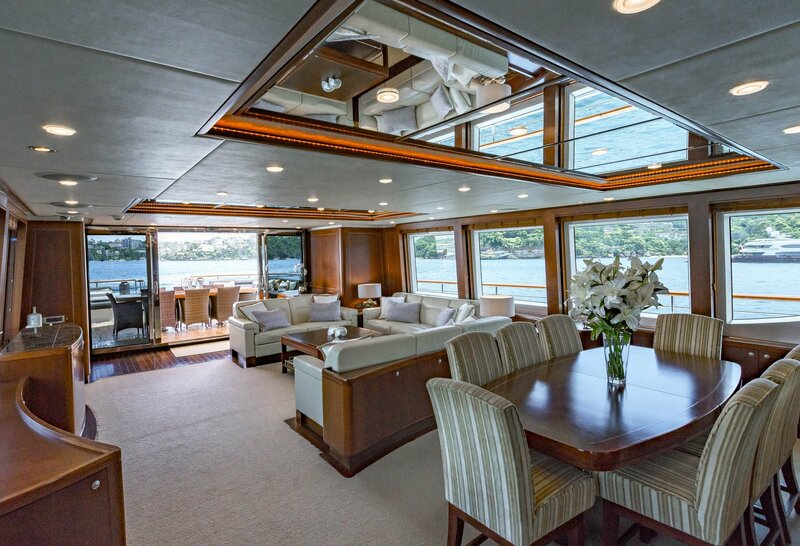 Forward of the dining area is a large galley, with earthy marble bench tops, with cooking facilities finished to the same standards as the rest of the yacht. 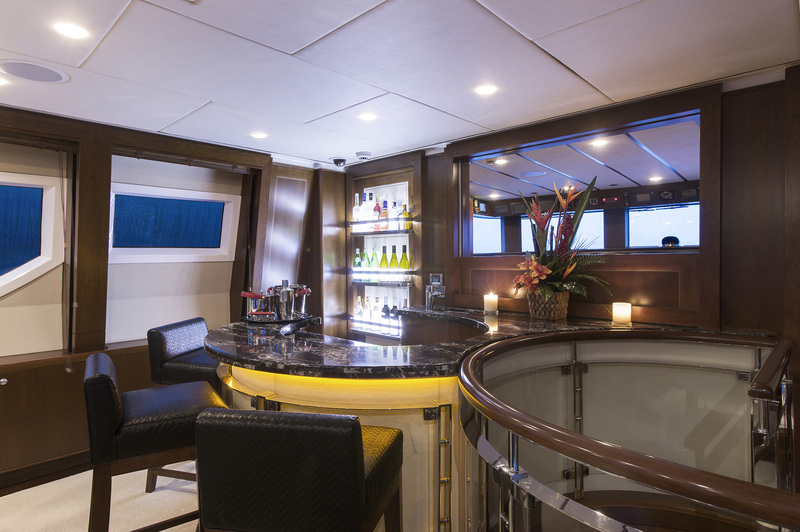 The galley also features a large lounge area and table for the owners or crew to casually spend time or dine. 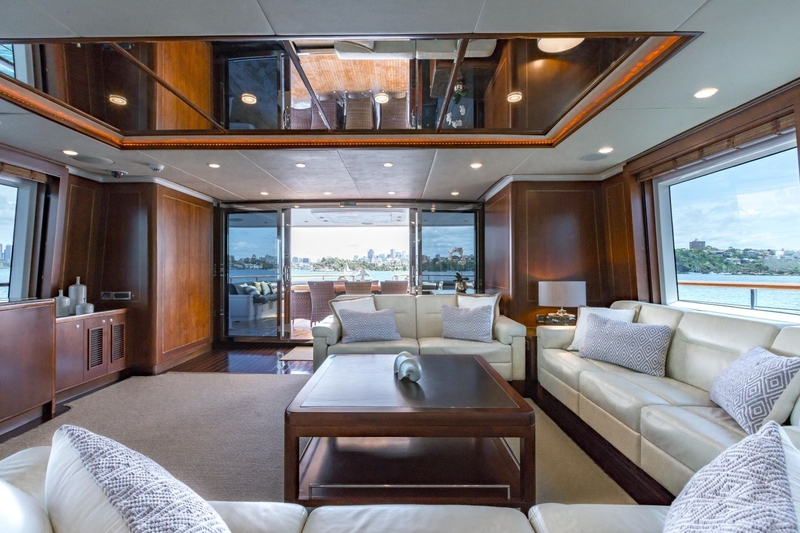 Up short internal stairs from the main deck and you will find the bridge deck featuring a large, comfortably furnished sky lounge, surrounded by massive, square panoramic windows – in 15 mm safety glass. 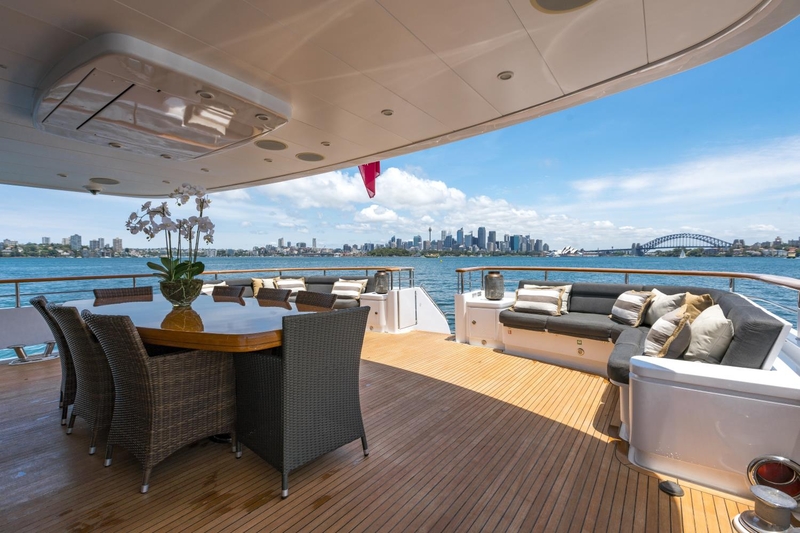 Designed for excellent views and more casual entertaining and relaxing, the deck incorporates a very cool black marble-topped bar, positioned just aft of the bridge which you can see through a retracted wall panel. 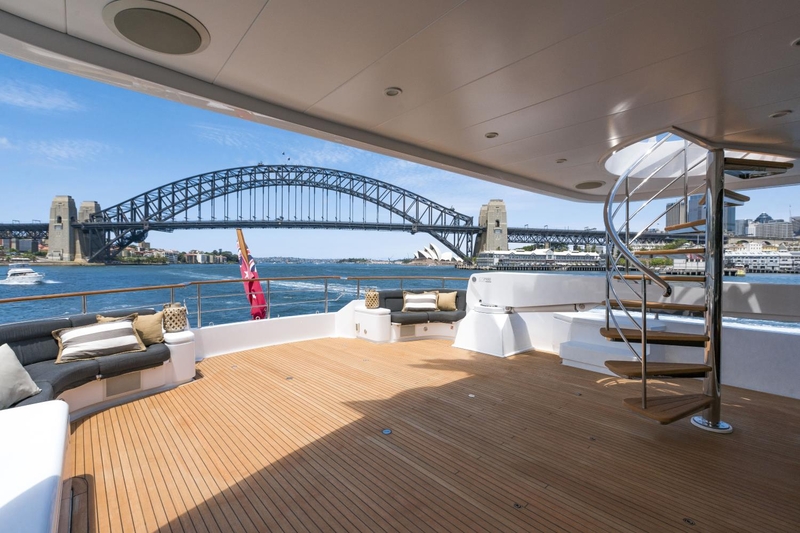 This automatically retracting wall can be opened so that guests in the sky lounge can look forward to the bridge and beyond to the sharp bow parting the waves. 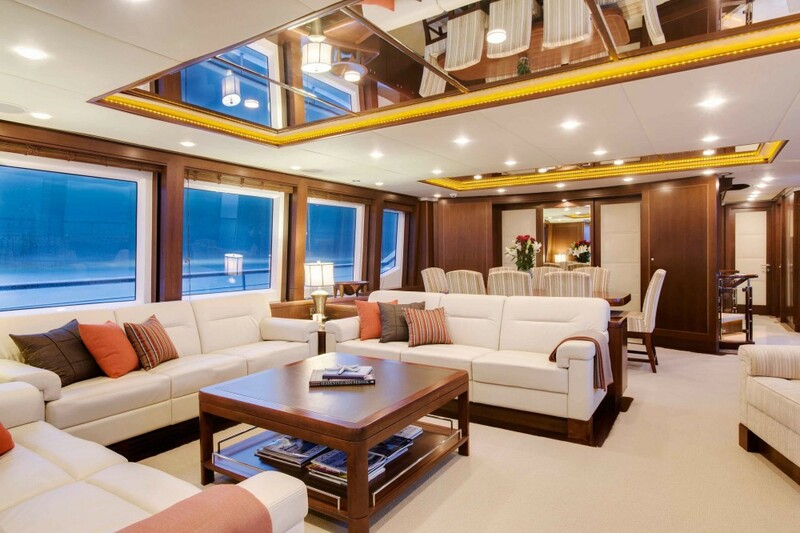 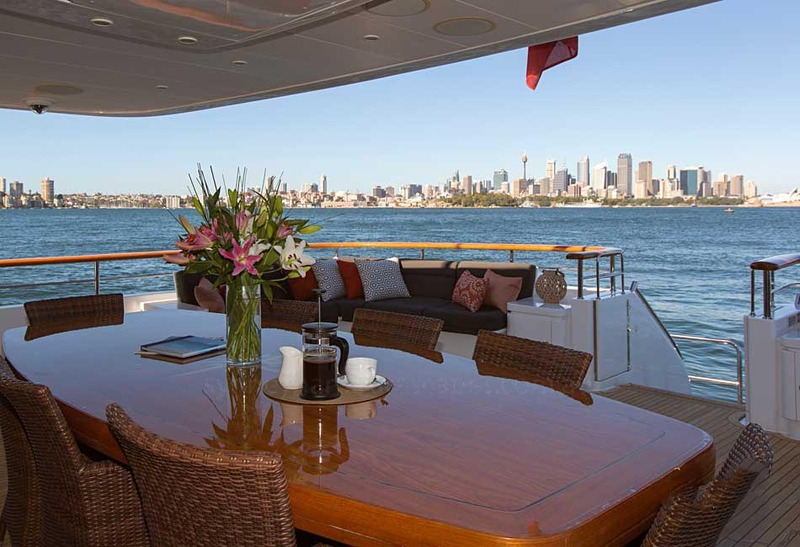 Accommodate is for up to 12 guests in 5 luxurious cabins. 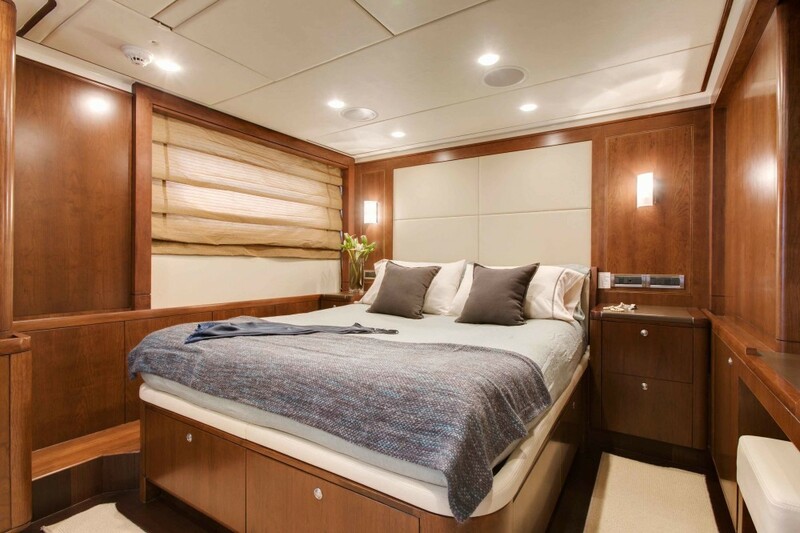 The large master cabin is located on the main deck forward and boasts a huge bathroom with spa to port and large walk-in robe to starboard. 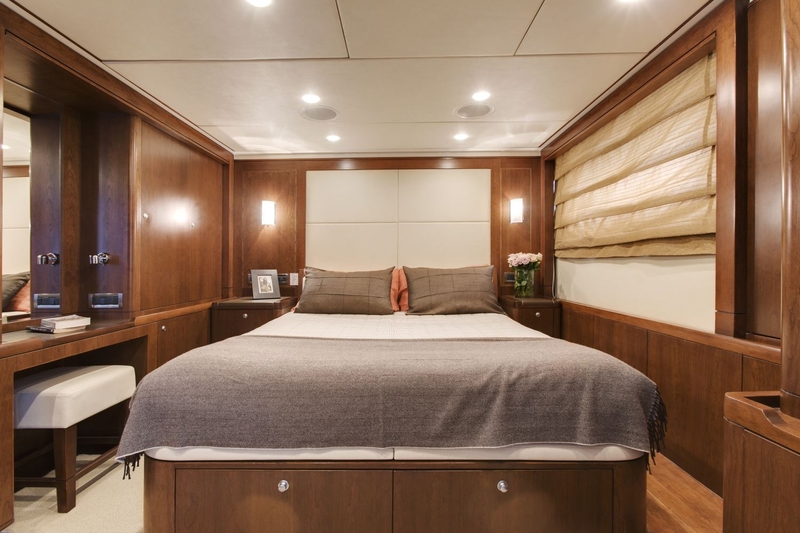 There is also a large pop-up TV opposite the foot of the bed, and a small study area for the owner with all the IT connections to the outside world you could wish for. 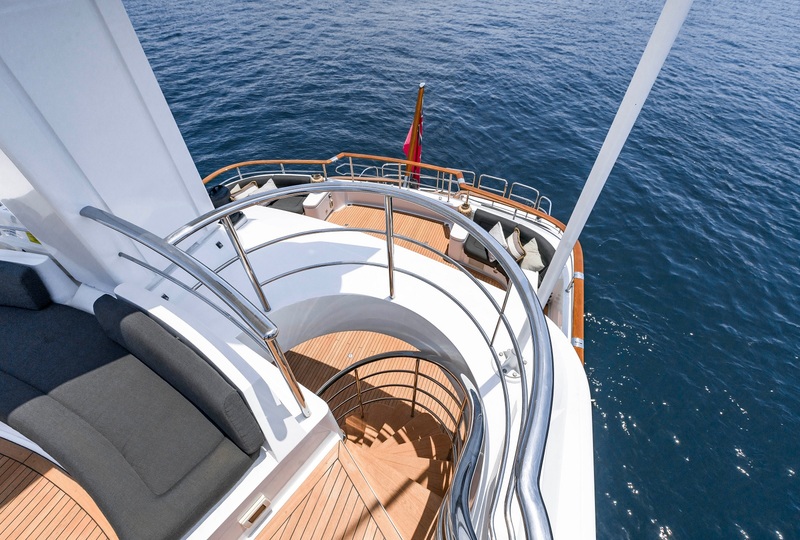 The lower accommodation deck is accessed via a gorgeous reverse S-shaped spiral stairway that curls down to a central marble-floored lobby. 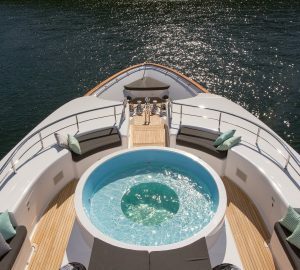 This deck features four large guest staterooms, all with marble-trimmed ensuites. 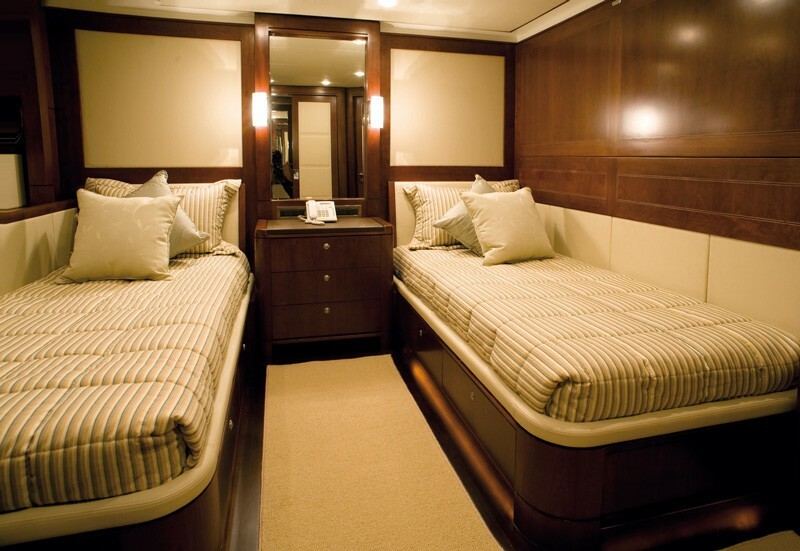 The two identical aft cabins feature double beds, and two twin cabins located forward with additional Pullman bunks in each are also identical. 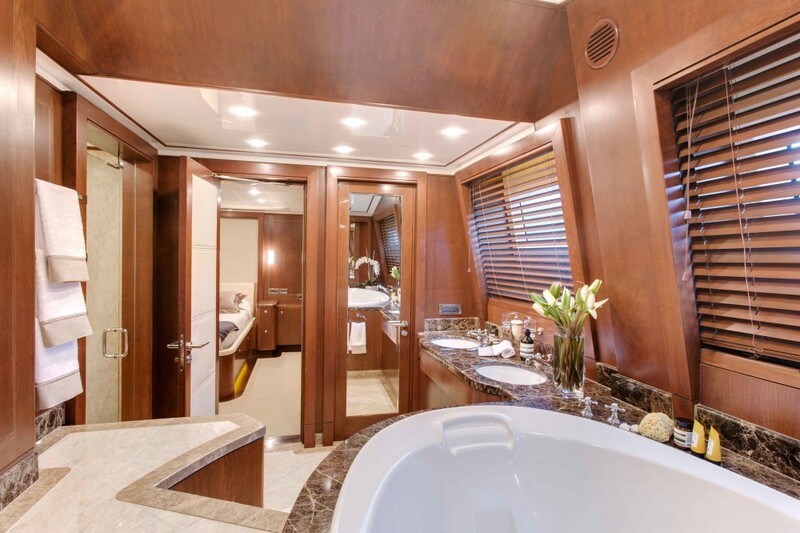 All the cabins have oversized rectangular portholes, flat screen TV’s hidden in the ceiling that drop down at the touch of a button, and heated towel rails in the ensuites. 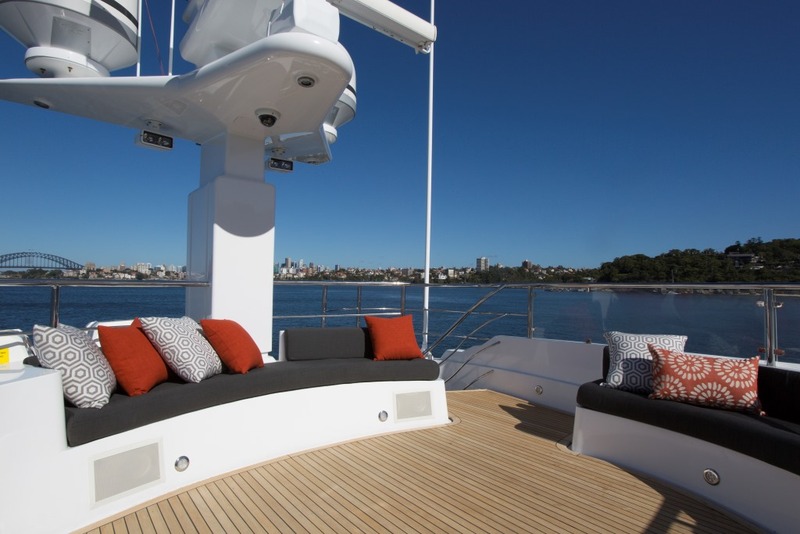 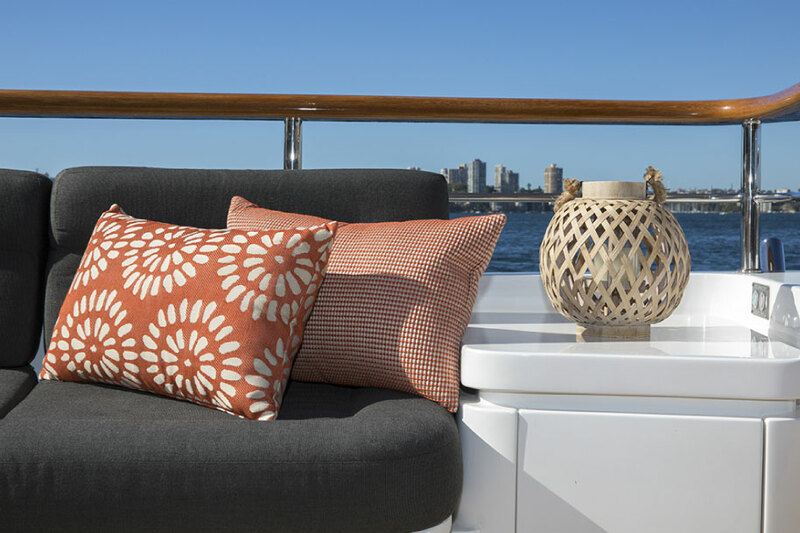 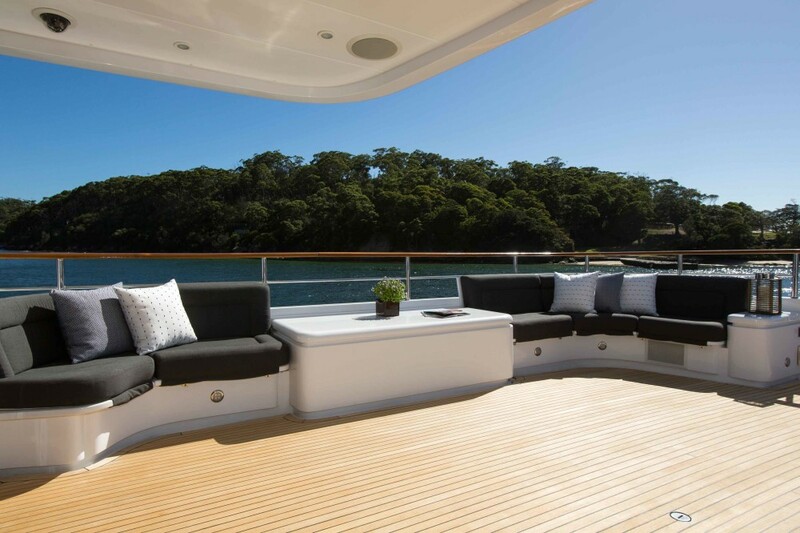 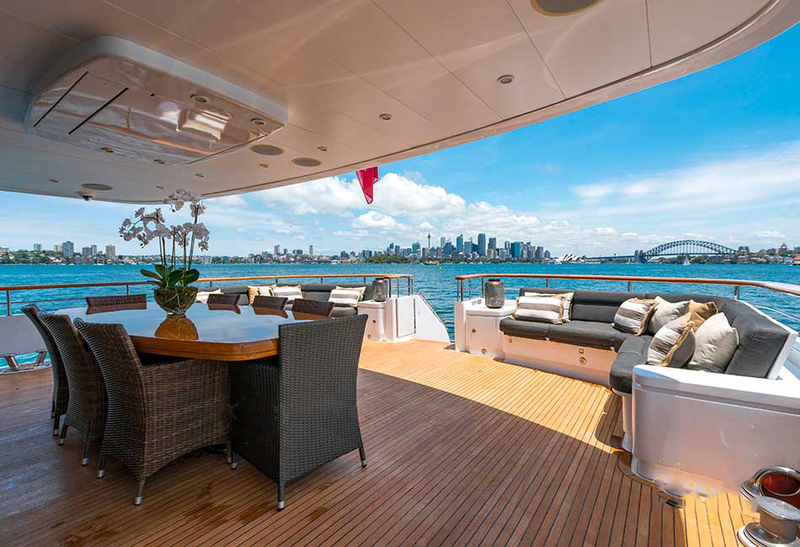 The luxury motor yacht MASTEKA 2 also boasts some great outdoor spaces for relaxing, entertaining and dining. 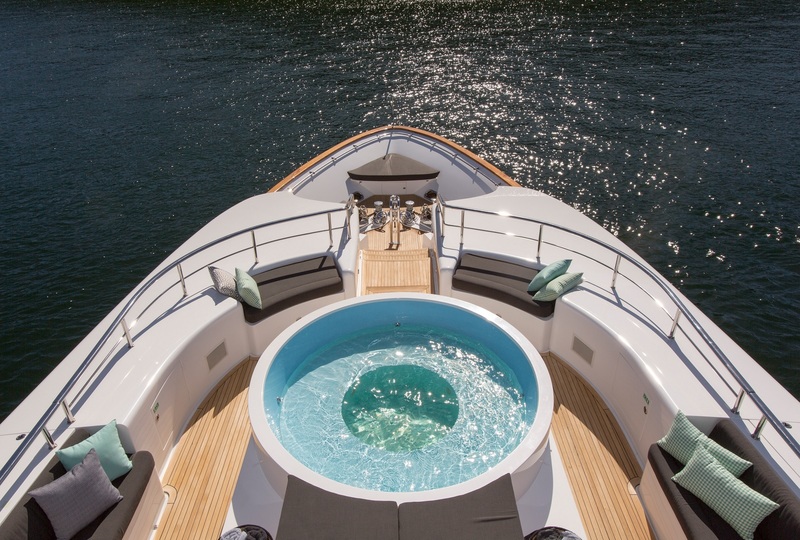 There is a massive Spa Pool tub located forward, directly ahead of the bridge, surrounded by plenty of comfortable seats and cushions. 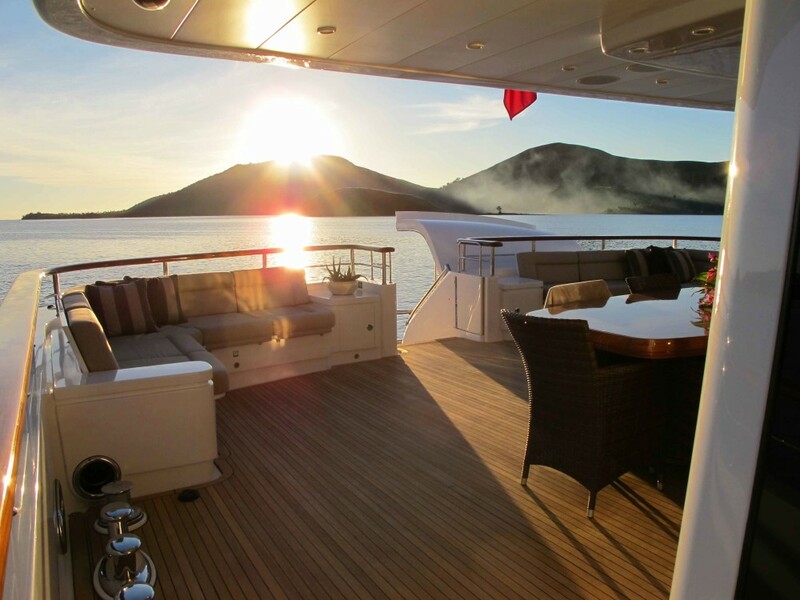 The spacious aft deck features a large covered al fresco dining table and stairs leading down to the swim platform. 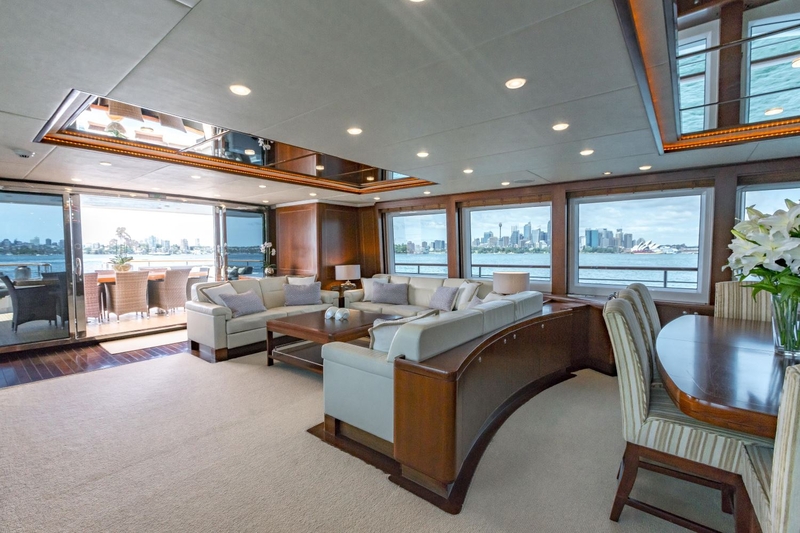 The upper deck, aft of the sky lounge, features a large teak laid area for sun lounges when the yacht is at anchor and when underway is used for storage of one of the two Castoldi turbo-diesel jet tenders aboard (the other identical tender is launched by a horizontal crane from the aft garage). 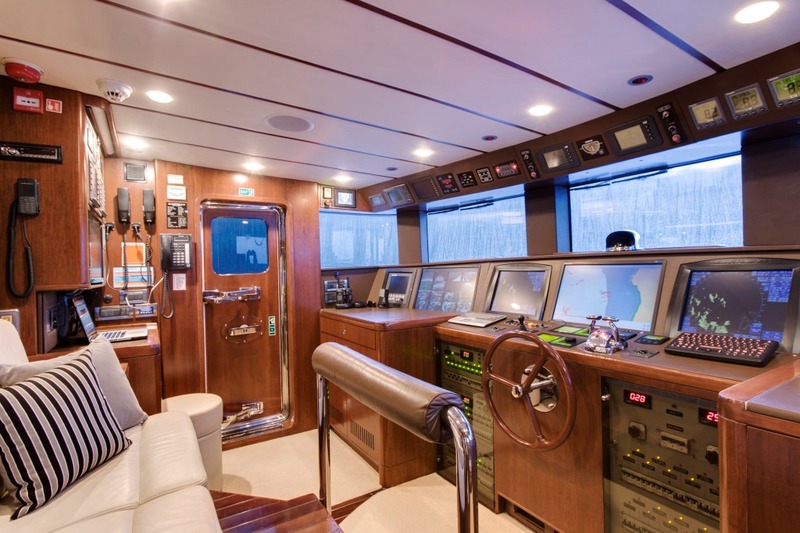 There is yet a further deck up a short flight of stairs on the port side, leading up to magnificent elevated views from sun beds and seating beneath the impressive custom designed radar mast, packed full of navigation and communications antennae. 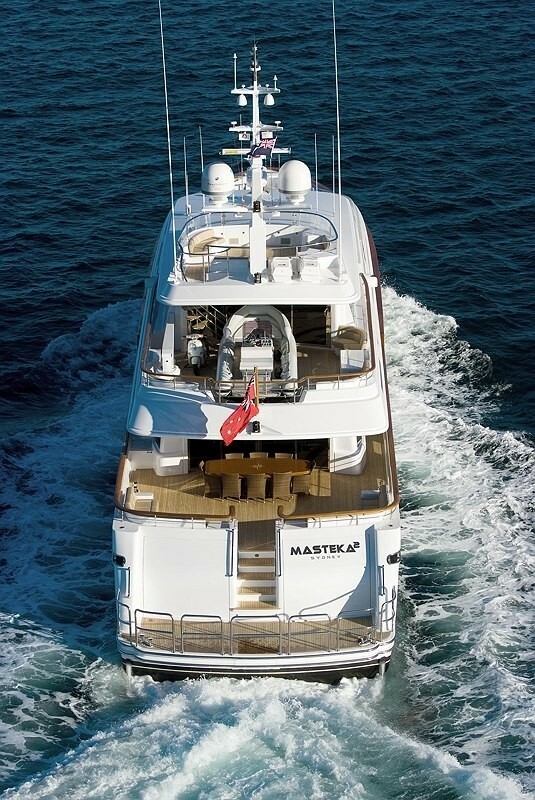 MASTEKA 2 is an efficient long-range cruising vessel. 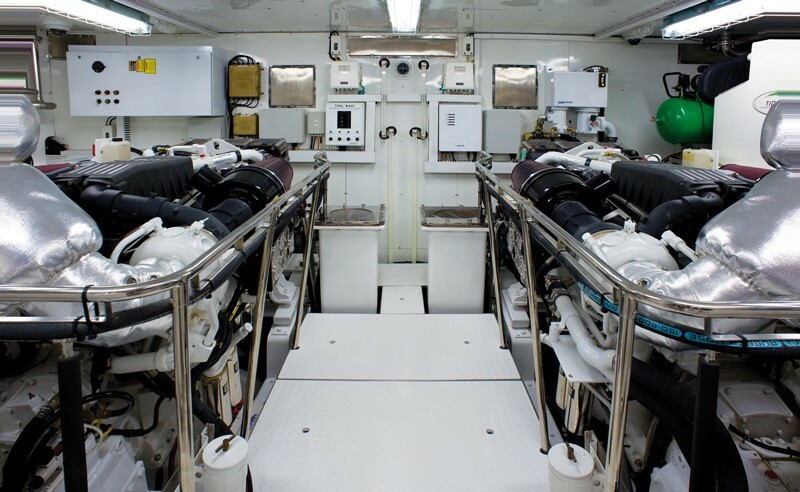 Powered by twin CAT C32 1675 hp diesel, spinning five blade Hansan propellors. 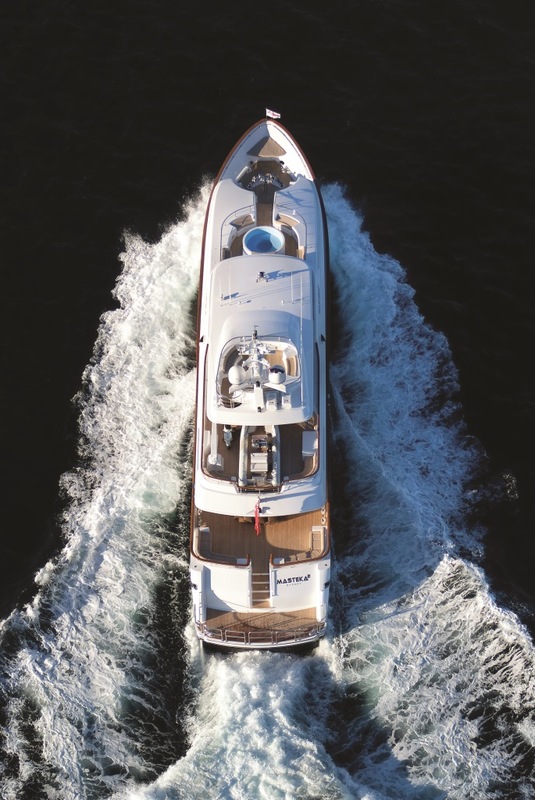 With 23,000 litres of diesel aboard, that’s a potential range of 3,000 nautical miles. 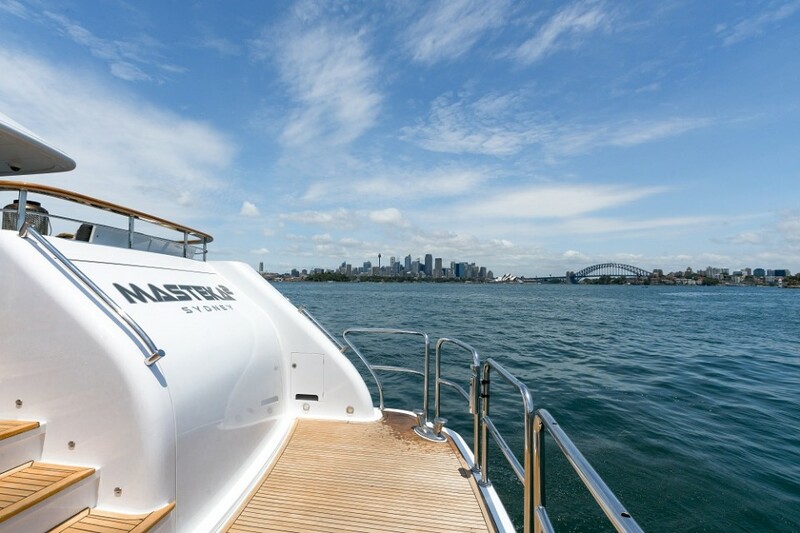 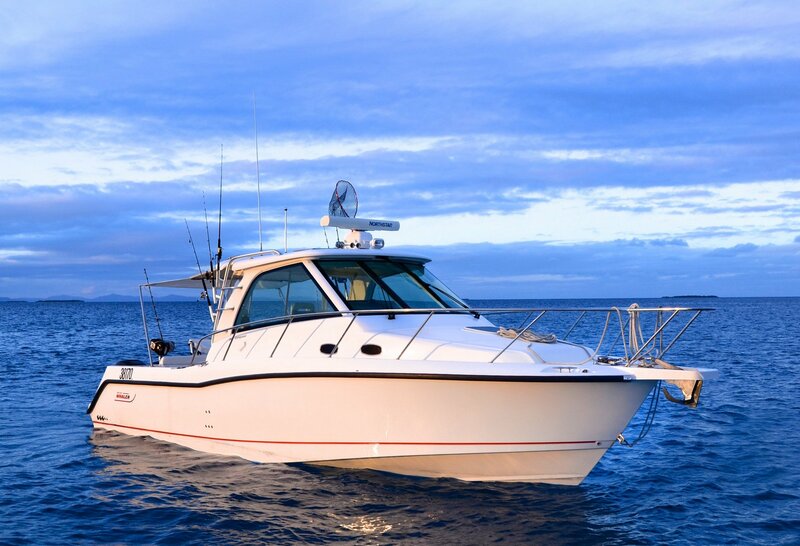 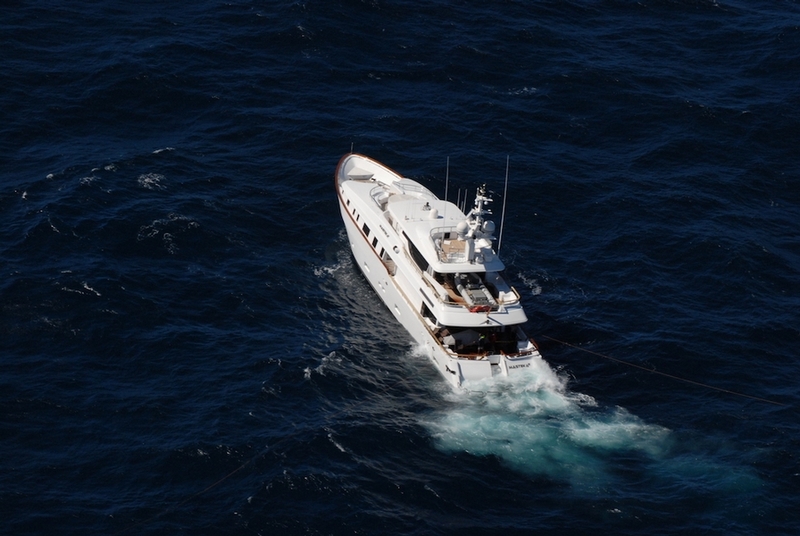 MASTEKA 2 boasts excellent sea-keeping ability and expedition qualities. 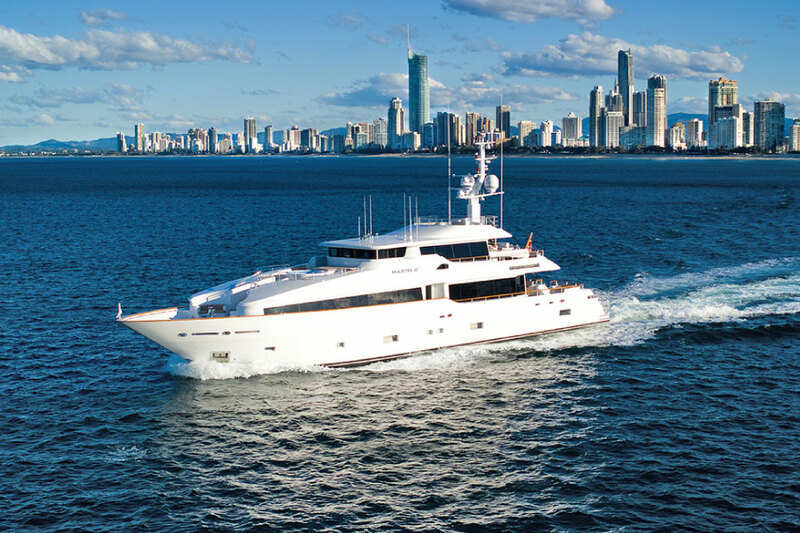 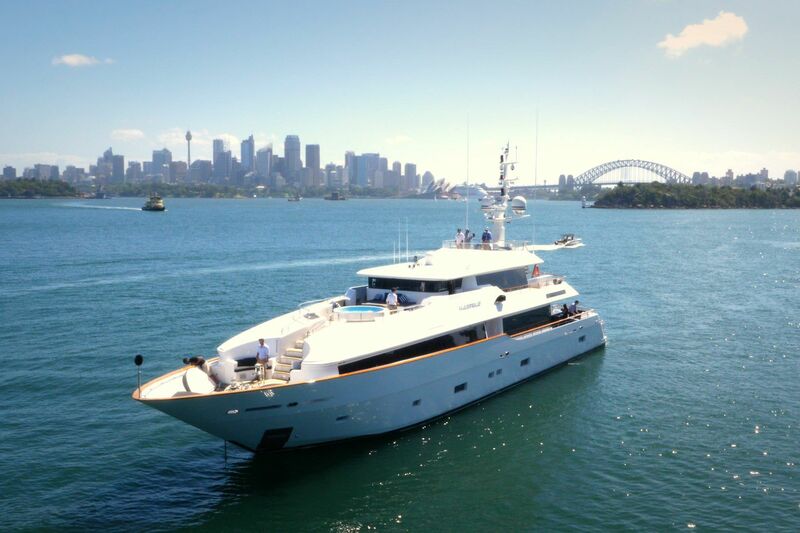 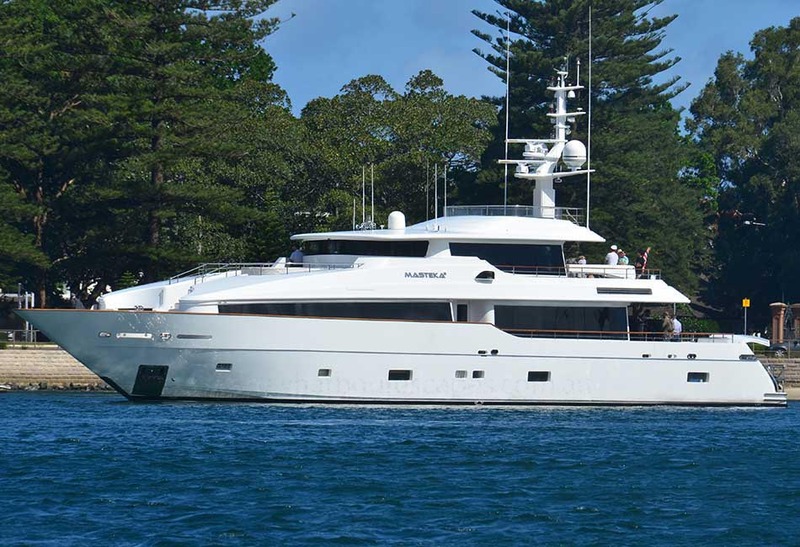 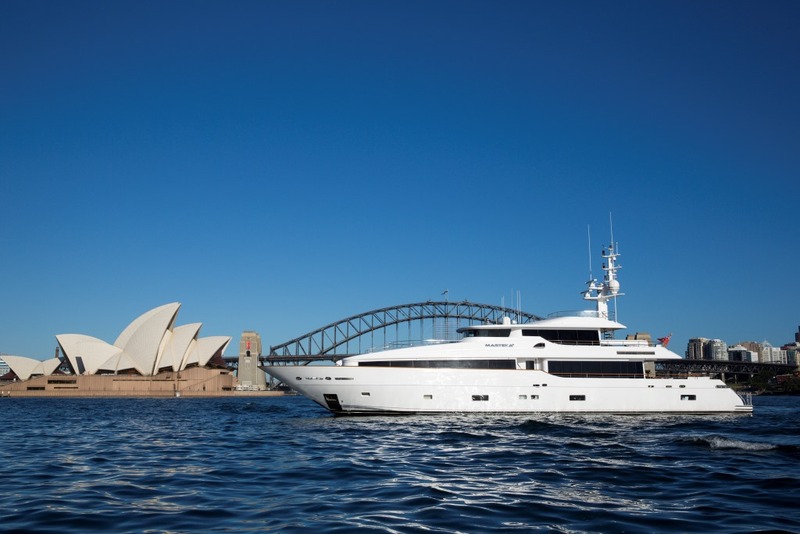 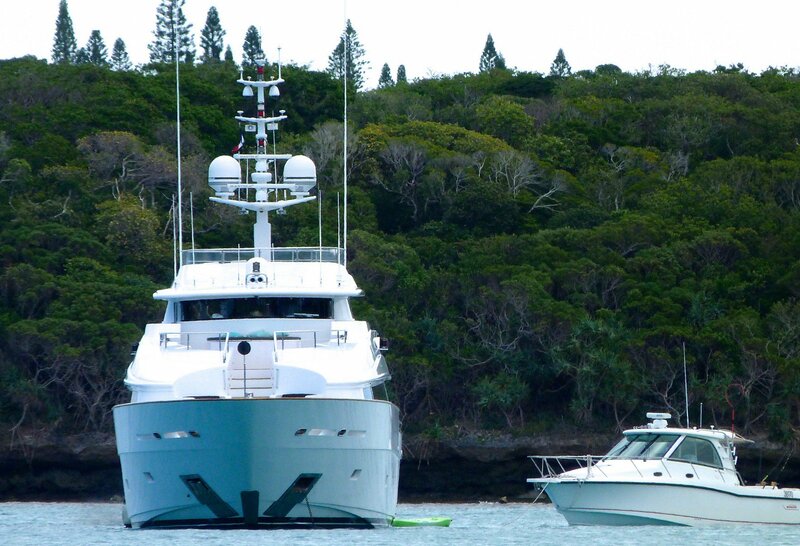 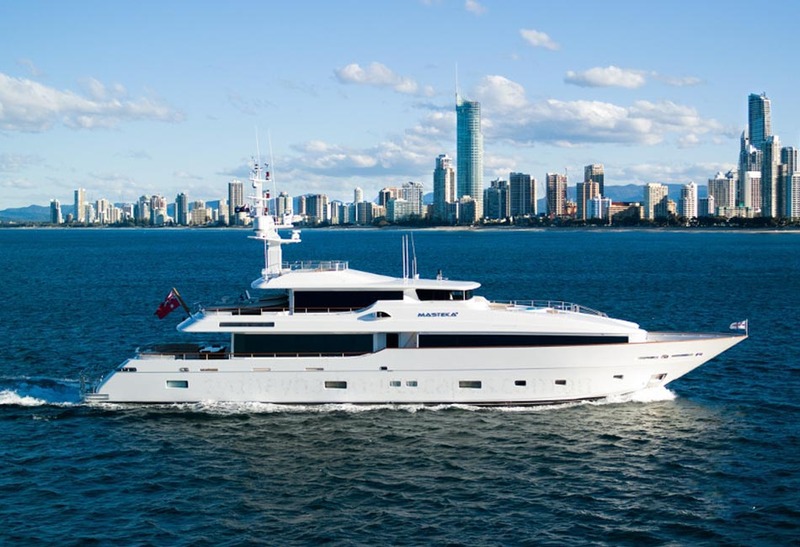 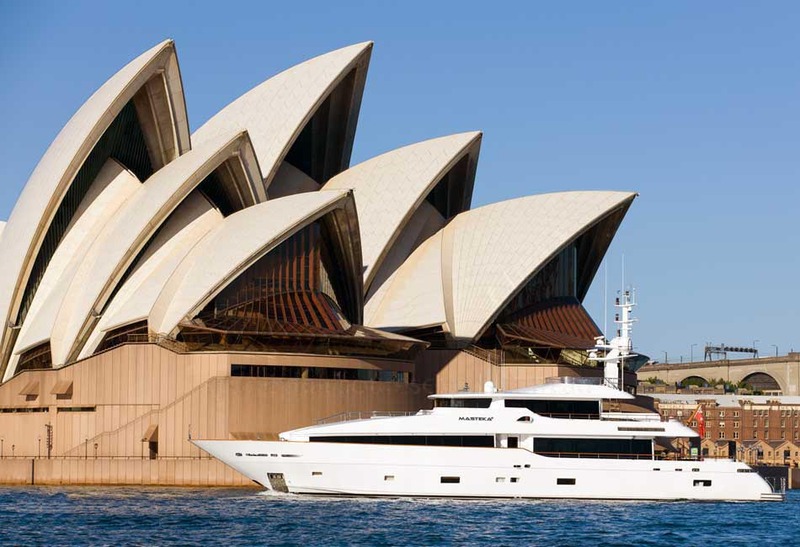 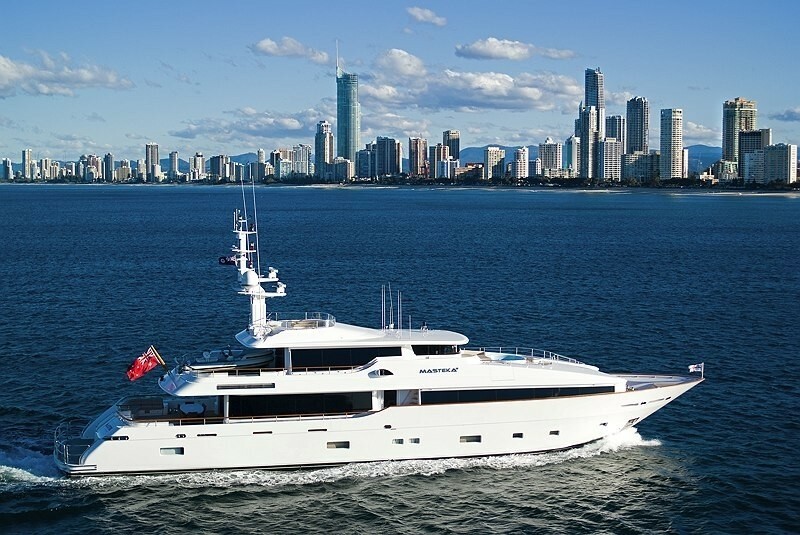 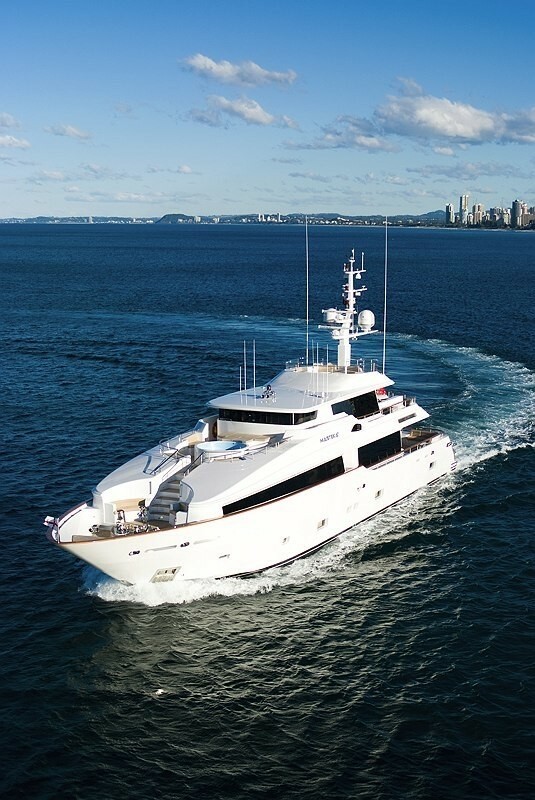 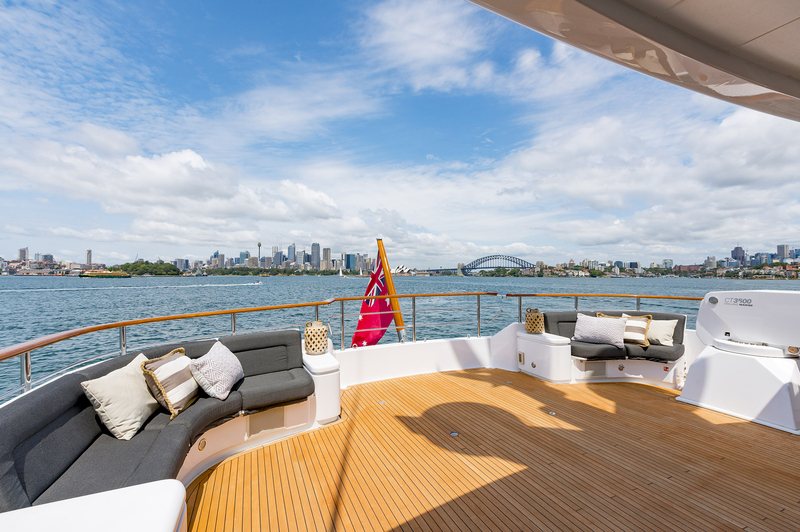 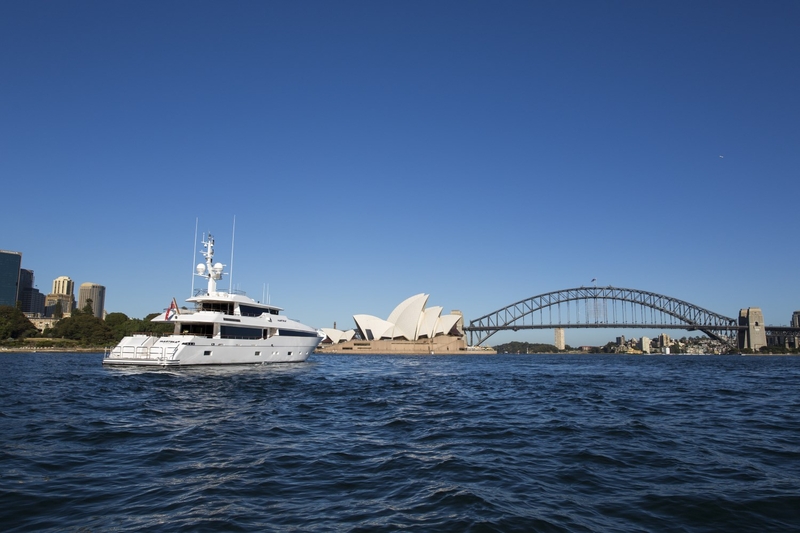 She was built to the strict Bureau Veritas Classification Code, 1 Charter Yacht – Motor – C+ Hull & Machinery – Unrestricted Navigation, combined with Australian NSW Maritime, 1C & 1D survey, making this yacht exceptionally safe, strong and capable. 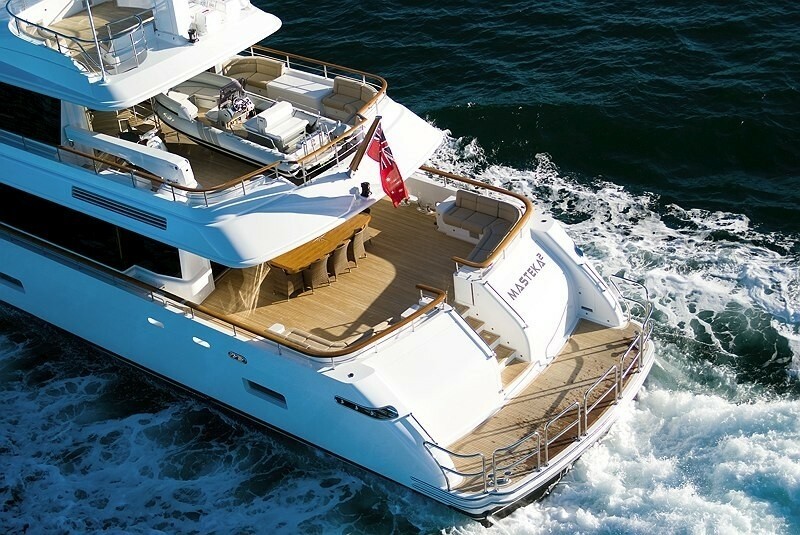 MASTEKA 2 can accommodate up to 12 guests in 5 luxurious cabins. 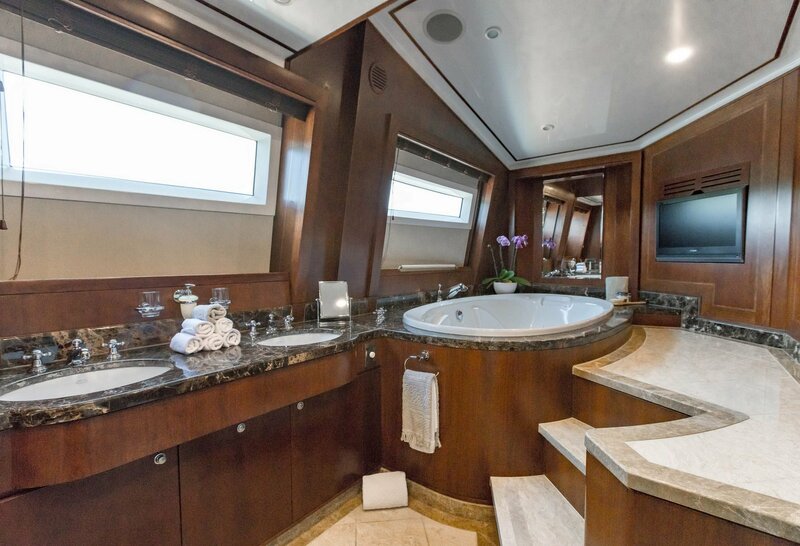 The large master cabin is located on the main deck forward and boasts a huge bathroom with spa to port and large walk-in robe to starboard. 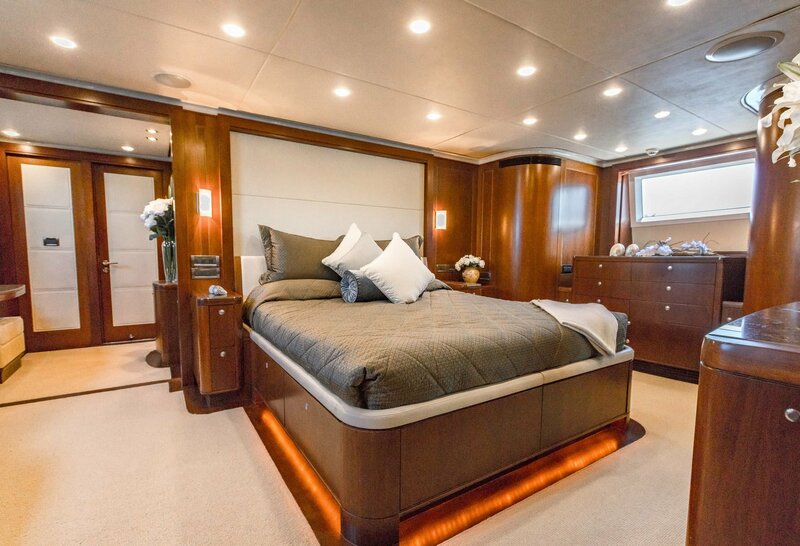 There is also a large pop-up TV opposite the foot of the bed, and a small study area for the owner. 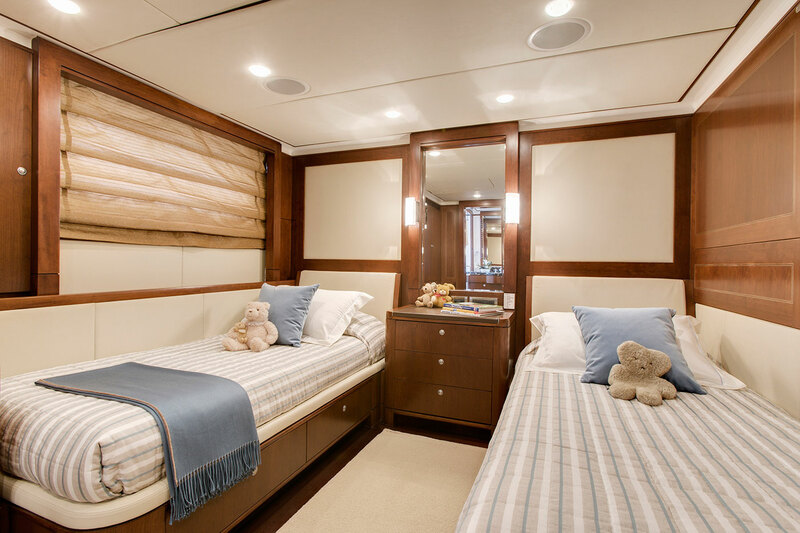 On the lower deck, there are two double cabins and two twin cabins with additional Pullman bunks. 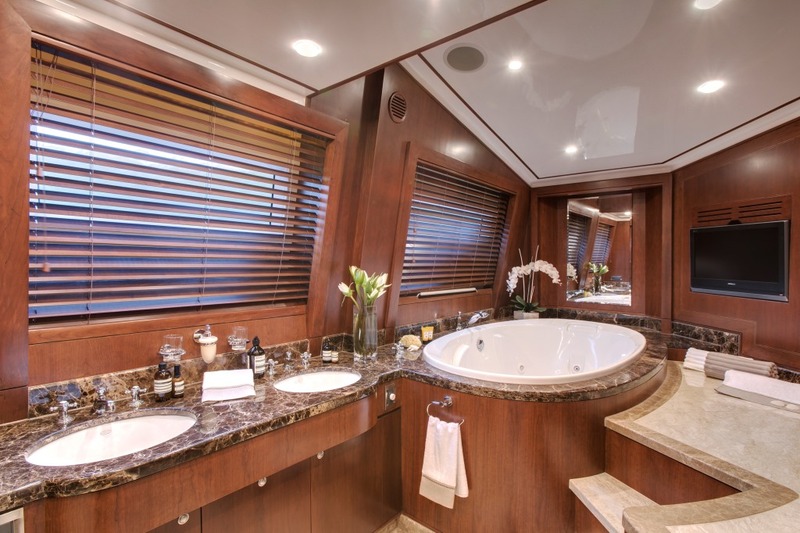 All the cabins have oversized rectangular portholes, flat screen TV’s hidden in the ceiling that drop down at the touch of a button, and heated towel rails in the ensuites. 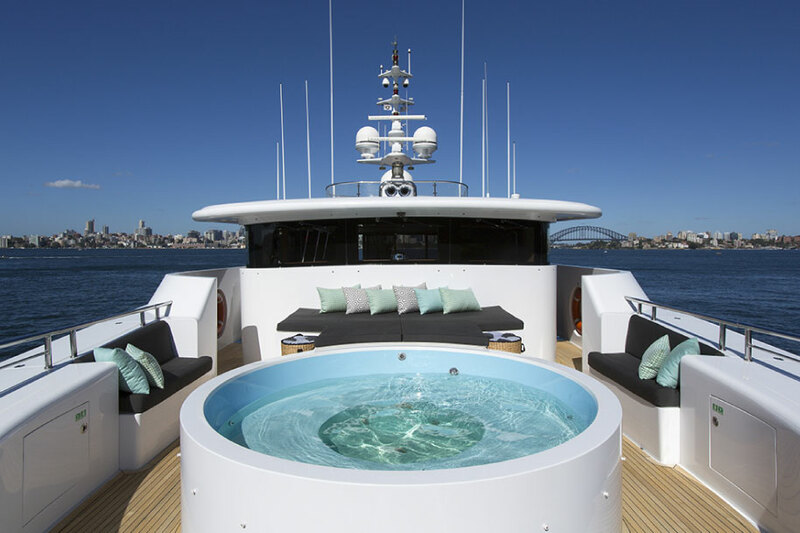 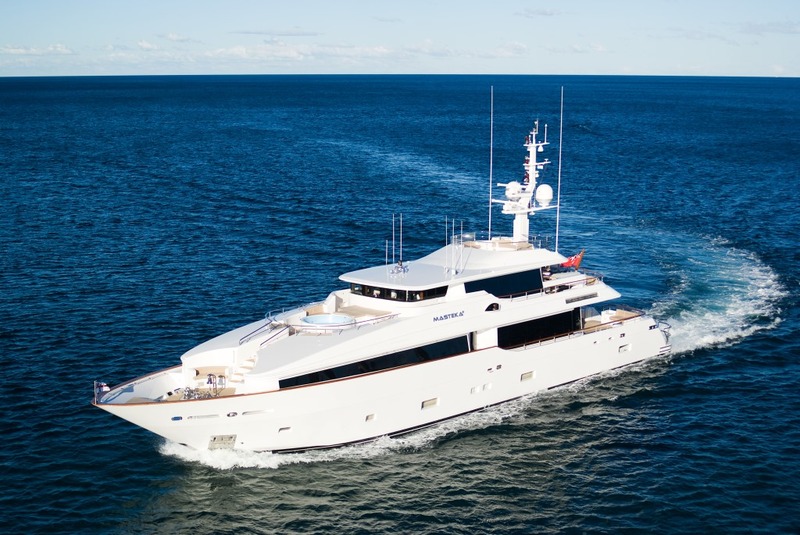 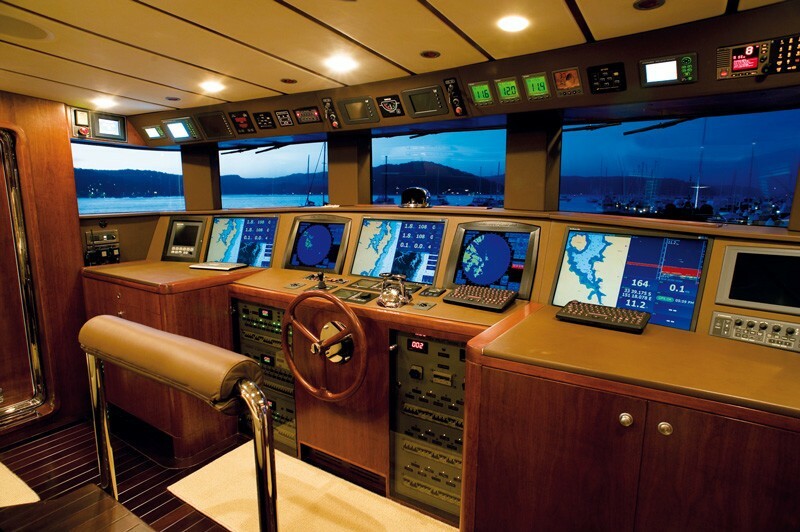 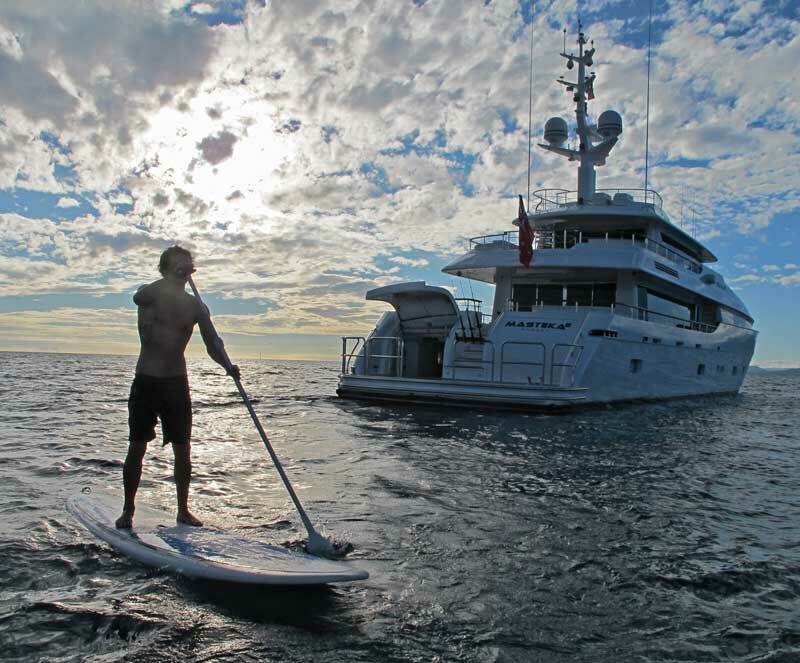 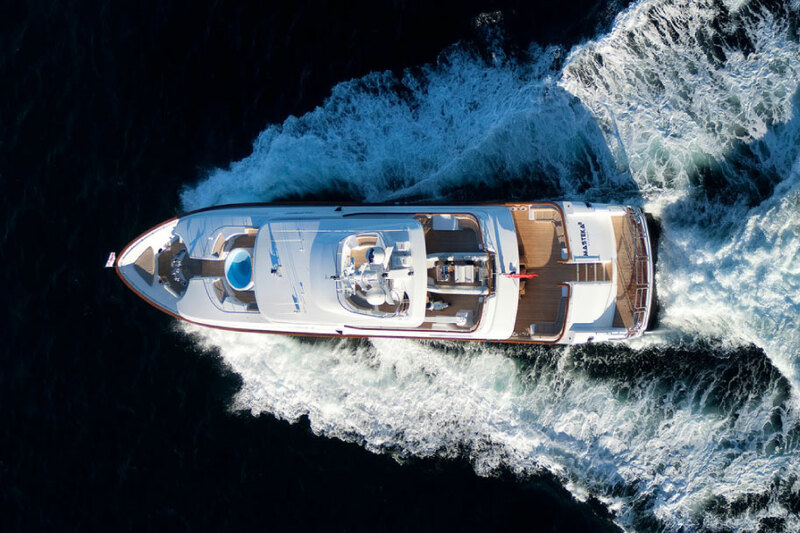 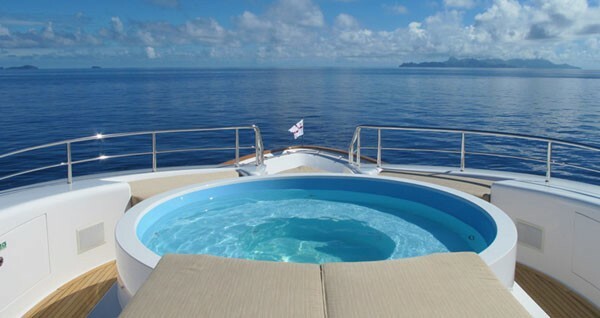 Please contact CharterWorld for a fill list of amenities and extras available onboard the MASTEKA 2 motor yacht.